#8048D Small Fryer | Pronto Pup Co., Inc.
3000 watts, 230 volts, two-wire service for domestic or export. Fries Pronto Pup corn dogs, Cheese Dogs, Shrimp Roles or Fried Veggies. Skewer clip assembly is “spring loaded” and can be quickly removed. Fryer basket is available for Bacon Puffs. 30 1b. Cooking oil capacity. Drain necessary for safe operations. 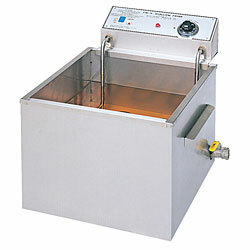 See our large selection of fryers, fryer accessories, mixes, and cutters.